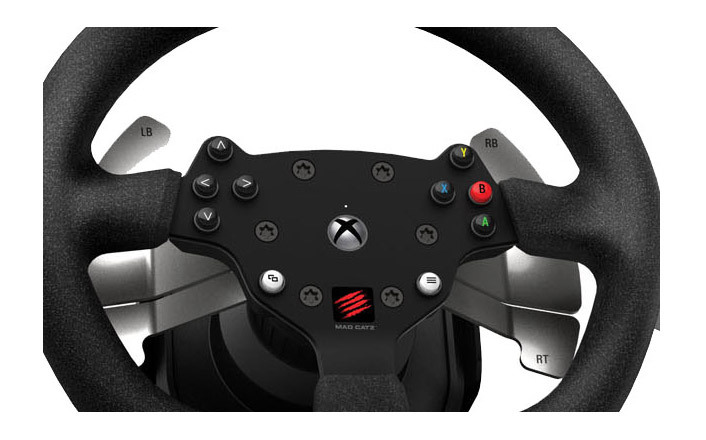 This isn’t Mad Catz first go at a racing wheel for the console. They recently made one for the Xbox 360 that we reviewed a few years back. Will this be a step up.. Keep reading and I’ll do my best to let you know, or watch the video above. 900 or 270 degrees of rotation is available. It features a modular design allowing the system to be expanded in the future. Nothing has been announced on that front as of yet. It has dual force feedback motors with a helical gear drive system. You can also set the steering wheel’s rake angle to one of four settings – ranging from zero to 15 degrees – with the included Allen key. The aluminum steering wheel is wrapped with genuine suede leather . Twin paddles promote instant gear shifting and are made of solid aluminum. Durable metal and strong ABS plastics impart the feeling of quality and craftsmanship, while high-precision internal components – like the wheel shaft’s dual roller bearings – boost racing efficiency. The wheel is 10.5 inches wide and about 10 inches from the bottom of the D Shaped rim to the top. It comes with a two pedal set. This is how they are referring to them.. Mimicking the adjust-ability commonly found on race-prepared coilover suspension, the pedals’ spring force and travel both conform to individual preferences. The pedals’ spacing can be set to nine different lateral positions, and they’re also height adjustable to offer a choice of upright or reclined configurations. 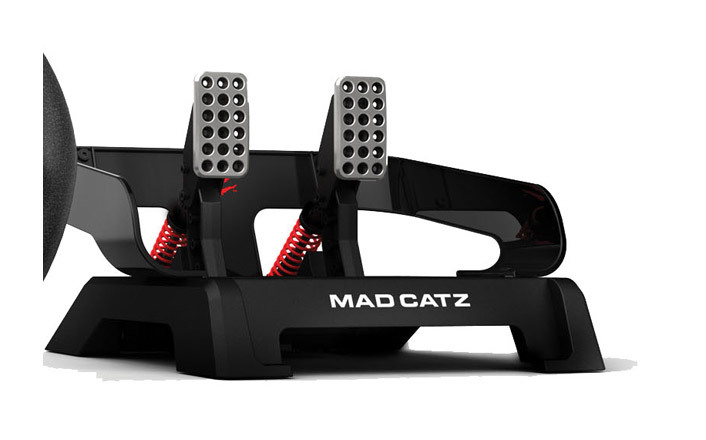 And, the pedal frame introduces the sensation of foot well limits, replicating the unique perspective of pro racers. The aluminum-faced pedals employ non-contact, position-sensing technology to increase longevity and reliability. 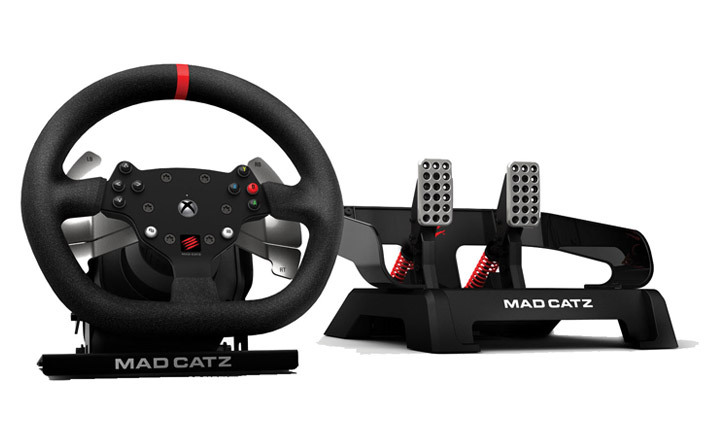 Taking a decisive step beyond commonplace installations, the Mad Catz Pro Racing Force Feedback Wheel and Pedals system easily integrates into Playseat’s Revolution* and Evolution* gaming seats. Providing the means for the ultimate home-racing rig, you benefit from uncompromising performance coupled with striking aesthetics. So.. Does this wheel compare to the competition in its price range?? Hopefully you’ll know after checking out this review. I’m not going to do a direct comparison so you’ll have to be the judge after watching this show and others that we’ve done. First up.. The original wheel I received had an issue where the wheel wouldn’t center. It was run centered at about 5 degrees to the right as you can see in my video above. 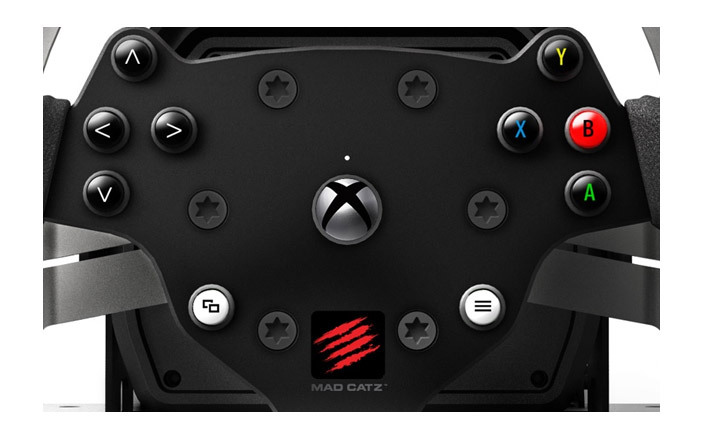 I contacted my Mad Catz rep and told them about this hoping there would be a quick fix or way to have it center properly, and there wasn’t. So they sent me a whole new setup and it didn’t have the same problem. I have heard from a few people that also had this issue and if you do, contact them for a new wheel or take it back to where you purchased it as that’s the only fix for it. 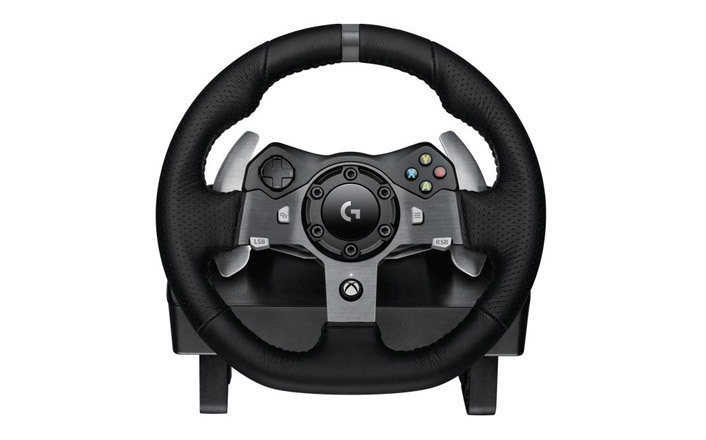 Currently you can only drive this wheel with one title and that’s Forza Motorsport 5 on the Xbox One. They are talking about future PC compatibility and I was hoping to see this for my review so I can try it on multiple titles but that’s currently not the case. If the wheel movement was smoother, less gritty I think it would feel a little more realistic. As it is.. It’s very notchy and doesn’t offer smooth movement and force feedback delivery. 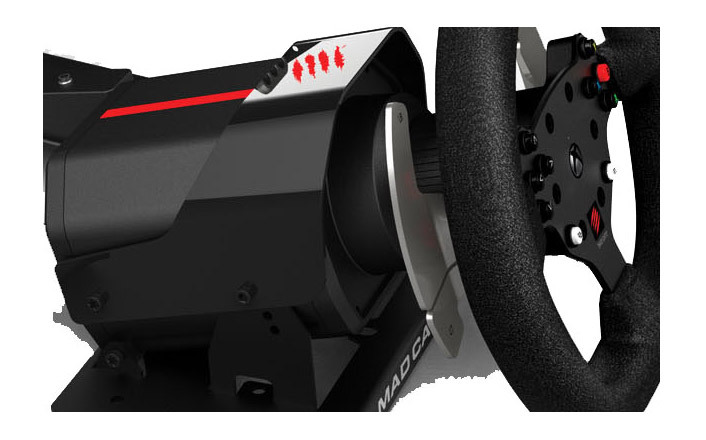 I also noticed that there’s no vibration sensations from Forza 5 where the TX wheel by Thrustmaster does have it. Maybe due to it having a belt drive versus helical gears. After posting my review, some mentioned they did feel vibration so I’ll have to try it again. It is precise and I’m able to run good lap times compared to the TX. The rim was a little small for my taste but I didn’t list it as a con because for some cars, it was great. For others it wasn’t bad. Paddle shifters are nicely placed and work great but don’t have a positive click like Im used to with just about every other paddle shifter I’ve tried. The other shift paddles seem to not be used for any function and you can’t map them. Would like to have used them as a clutch. The wheel rim buttons offer a nice click, but I’m not fond of the D pad since it’s 4 buttons. Would prefer a traditional D pad. I did get a manual with my replacement wheel and found out what the extra piece of plastic was for from my unboxing video. Would also like to thank Vesa Kela and LogiForce86 in the You Tube comments from my unboxing for giving me a link to a manual and or description of it. It attaches to the throttle to avoid your foot from slipping off it. I didn’t attach it due to my feet being a size 12 and needing as much room as I can get. Although the pedals are light weight, I like them . With the adjustable pressure on the brake it provides some decent progression. I can brake really well with it. I could do without the plastic wings that are supposed to simulate the limitations of a foot well in a car. Although lightweight when attaching the the enclosed “skis”, it makes them feel a little more substantial and provides a solid mounting option for cockpits. First up.. It’s not a bad wheel and pedal set. I do think it’s overpriced and feel it’s more of an entry level setup similar to a Logitech DFGT. It does offer more functionality in the pedal department, but the wheel itself reminds me of a DFGT or G27 with it’s helical gear mechanism. I think if this wheel was priced closer to the $250 range it would be perfect at that price point and a great entry level setup. Looking forward to seeing how it performs on the PC as well since all I could try it with was Forza. Also wondering if the notchyness will go away on the PC. Would love to hear your comments if you own one of these to see hot it compares to my review. 900 degrees to 270 degrees of rotation with a flip of a switch. Can also run it anywhere in between with the slider in game on Forza. Lots of mounting options especially for Playseat owners that can attach it directly to that center floor post. Only compatible with Xbox One and currently only Forza 5 – With the delayed release I was expecting PC compatibility at this point. Pedals are mostly plastic and very light weight.